I have been on a bread making spree as of late, even going so far as to make it a point to not buy bread anymore. This is my first stab at a baguette form factor. It’s a high-hydration (80%) dough, counter risen and then cold stored. It was cooked on pre-heated cast iron in a humid oven. The same dough works fine for a boule or even smaller roll type applications. I have yet to try it for pizza crust, but it seems like it would work (with some extra effort fighting the stickiness that comes with a high-hydration dough). Quite happy with it and I find this shape perfect for sandwiches. 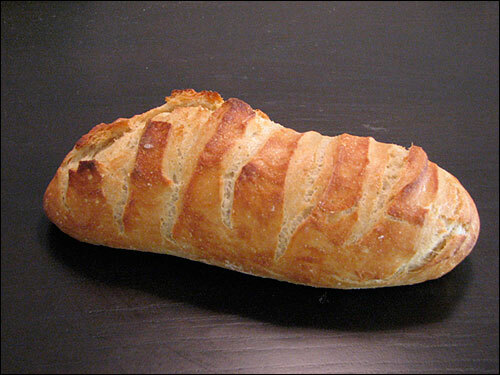 Even better that I can make a stubby baguette like this and not have to throw out the part that always goes stale on me if I buy a full-size loaf.